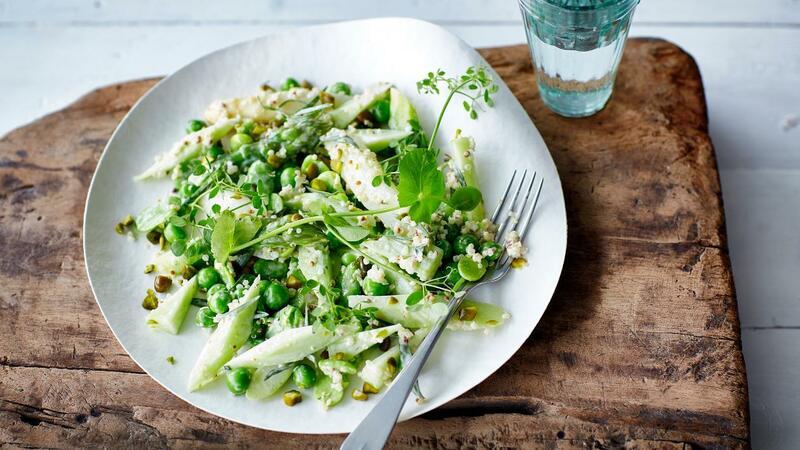 Vegetarian salad with white and green asparagus, fresh peas, broad beans, cucumber and quinoa. A perfect addition to your summer menu! Peel the asparagus, Blanche the white asparagus, let it cool down. Blanche the green asparagus, peas and broad beans and put them directly on ice water. Pop the broad beans out of their outer skin. Cook the quinoa. Rinse with cold water and put it on a sieve. Mix the Hellmann’s Real Mayonnaise with both mustards, chopped tarragon and bring to taste with some black pepper and fresh lemon juice. Mix the vegetables with the quinoa and sauce. If necessary, season with some salt and pepper. Finish the salad with some crushed pistachio nuts, pea sprouts and tarragon leafs.